I have had Jan Bondeson's The London Monster on my shelf since early 2007. I am not entirely sure what made me pick it up. Do you ever try to figure that out? Why suddenly, a book you've overlooked for years pops off the shelf at you and you finally settle down to read it? I am sometimes able to trace my reasoning, but in this case, no idea. The book is about a series of crimes in London in the early 1790s. Pretty women complained of a man accosting them on the street, saying dirty things and then often cutting them across the thigh or behind with a sharp blade and then laughing in their faces while they screamed in terror. Sometimes, he would insist that they smell a bunch of artificial flowers and then shove the nosegay in their faces, cutting them with a hidden blade. He never killed any of them, but he wreaked havoc on the streets of the city and made many women fear to go out at night. Eventually, Rhynwick Williams was arrested, charged and found guilty of the crimes and sentenced to a steep prison sentence. He was defended by the fabulously namd Theophilus Swift, a larger-than-life Irishman who liked to be the center of attention and made the trial even more fantastic. This book was absorbing and eye-opening. It was so interesting to read about the very scant and ill-trained police force in London during the Georgian era, and even more interesting to learn about the ridiculous Theophilus Swift. Many times, I thought the author must be exaggerating because I felt like there was no way such a man could truly exist- not only did he challenge a duke to a duel, but he also accused Prime Minister Pitt of trying to kill off the royal family, got into a huge kerfuffle with the deans of Trinity College and had a very volatile marriage. This was the man who stood up to defend the rights of Rhynwick Williams. But Swift wasn't the only interesting character involved in this drama. There were the women who suffered at the hands of the London Monster, many of which described men of very different physical descriptions and were unable to positively identify Williams as the culprit. 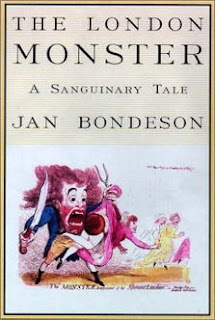 There was the wealthy Mr. Angerstein, who offered a huge reward to anyone who could find the Monster, leading to a great many greedy people falsely accusing others of the crimes. There were the judges that presided over the cases, the barristers for the prosecution and the defense. There was the absolutely insane charge against Williams itself, made so that he could be charged with the felony of tearing people's clothes rather than the lesser charge of attempted murder (yes, it's true). I am likely to enjoy any book set in England during the Georgian era, so I am quite likely biased in enjoying this book so much. I really enjoyed the ambiguity surrounding the case- was Rhynwick Williams the London Monster or no? There was so much obstruction of justice, so much inconsistency and so many theatrics in the trial that I can't believe it proceeded fairly. It was a charged atmosphere- women in the 18th century were considered "weaker men" and often fainted at the sight of a mouse or a strong glance (so says the author, but I just find this so hard to believe). And so of course, being accosted in the street would result in serious palpitations. I wish more of the women had been open about the "vile words" that the monster used on them- no doubt they'd seem less vile to modern ears- rather than just blushing and avoiding the topic. I can't help but think that it's stories like this that are used, time and again through history, to keep women inside and frightened and afraid of all the horrible things that can happen to them Outside. The book put me strongly in mind of Arthur Miller's The Crucible in which a few bored women wanted attention and started a horrible mass hysteria. I also loved all the illustrations in this book! There is a rich array of political cartoons and notices and prints that really added to my appreciation of London's workings at the time. However, I didn't love the end of the book. The author spends some time describing mass hysteria, its effects, and the psychology of serial criminals. I didn't find these chapters nearly as interesting as the story of the London Monster itself because the author doesn't seem like an expert on the subject of criminal minds, whereas he certainly seems to know a lot about the Georgian era justice system. I really enjoyed this book on what has become an obscure historical footnote. An appealing book that describes not only the legal system in place at the time, but also a lot of social norms and larger-than-life characters that lived in the period. Um, this looks AMAZING. Adding to my list right now. I have never even heard of this incident, but your review of this one was wonderful, and makes me want to seek this book out really soon! I think that it all sounds so bizarre, especially Swift and all his antics. This would be a great read to just lose myself in, you know what I mean? Great review today, Aarti. I need to look for this book! I have never heard of this before and I quite like the cover. Good review! I have never heard of this title, but it sounds incredibly interesting. Your description reminds me a little of The Madman and the Professor. Thanks for the great review! Wow, I'd never heard of this one, but the book sounds like it's really something!!! Thanks for your review! Reading Rambo - It is! It's so interesting. Zibilee - I had never heard of it, either, but there is so much information available on the topic, particularly from people contemporary to the period. Made for great reading. Kailana - Haha, that's one of the political cartoons I liked so much. Col Reads - Oh, I've heard great things about that book, too! I should read it. Andi - Of course, hope you give it a try! Wow, that's a true story? Wild! I'm not surprised to hear about the women fainting away at a strong glance, we all are products of our times. It does seem manufactured to keep women in the homes "safe" though, doesn't it? The Madman and the Professor was really good but not nearly as sensationalistic as this sounds. I have to find a copy. Isn't it weird how a book will languish forever and then suddenly, it's time to read it? I used to find books in bookstores/libraries that way as well. Hey! I've heard of this! Not this book but this phenomenon. I weirdly heard about it like two days ago, and now here you are writing a blog post about a book about it. Weird universe synergy. I read about this in the course of doing research for my dissertation, and now I wonder if the popularity of Larson's The Devil in the White City (2004) led to more books like this being published, digging farther back. The fainting thing is usually attributed to corsets now, not just "weakness"
I also can't help but wonder what the vile words were, exactly! You're right, they'd probably seem pretty tame to us now. I think I told you before that I'd like to read more Georgian/Regency non-fiction, since my reading is so Victorian-biased, and this seems to fit the bill perfectly. Jeanne - This was written before Devil in the White City, so I don't think that reasoning quite fits, but I agree that there are a lot more books like this out there now! Nymeth - Yes, definitely! It is interesting how non-fiction reading can progress, as you want to understand how the Victorians got the way they were by first understanding the Georgians. I like the sounds of this book - as far as taking a sensational incident and using it to peruse the era at large. Although the crime itself reminds me of some recent crimes in some Northern Virginia malls, where there were several incidents of women being stabbed in the buttocks. I had never heard about this individual and his reign of terror, but your wonderful review has made me head off to my library website to see if they have a copy! The events sound fascinating in and of themselves, and from your description, it seems that the author did a wonderful job bringing it all to life.